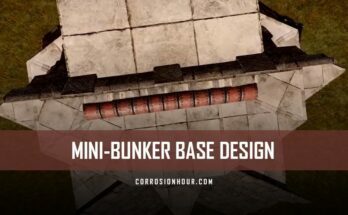 Back with a new RUST base design, our partner Malonik has crafted a fantastic solo/duo starter bunker base design. The goal of this base was to be able to create a cheap and effective solo/duo starter base that could expand into a highly defensible stability bunker. This design is cost effective and has multiple options for you to build towards. This base requires 23 satchels minimum (if raided on the golden path to the TC) and main loot. The great thing about this base is that it can be quite elusive and is designed to trick raiders into raiding the decoy portion of the base. Hey guys! 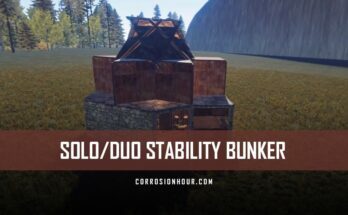 Mal here and today I’ve got a cheap zero-bp solo duo starter bunker for you! This tiny starter is jam packed with everything you need. It has 3 small furnaces, 8 large boxes, a workbench, room for a research table and an optional shooting floor. Additionally, you don’t need any blueprints, so this base can be built easily even on a full wipe. The stability bunker has 5 of your large boxes and your TC inside it. No matter which way a raider comes at it they’re going to have to burn 23 satchels or over 400 explosive rounds to get in if they take the most efficient path. If they decide to door raid it instead, they’re wasting resources to get to your trash loot. Making this base safe from the usual early wipe raiding. The shooting floor provides an extra level of defense and visibility over the usual 2×1 option that most tend to go for. Having a shooting floor allows you to control your area when you’re ready to expand and to see what’s happening a hell of a lot better. Let’s start off by taking a look at how this works. Say you’ve been out farming, or pvping and you’ve come back with a ton of juicy loot. Once you’re inside you f1 kill and respawn on your bag. Knock out this twig half wall and your bunker is now open and ready to use. When you’re done and want to seal it back up build a half wall here leaving it as twig. Then a triangle and square floor in metal. If they want in they’re going to have to spend a whole lot of booms. Let’s take a look at what this base cost. Here is what it will cost to build the base in stone. Once you have your furnaces going, you’re going to need 2,250 metal to upgrade your bunker. Once it’s fully built this is the upkeep that you’ll be paying for it. Now let’s take a look at how we build this base. We’re going to start off with 3 triangle foundations in a row. Add walls at the back and sides. A single doorway on the front and roof it off. Upgrade it all to wood, throw a door on it, put a TC in the left corner like this and your sleeping bag down in the right corner like this. You can use this to start off and farm resources. Once you’ve got enough farm it’s time to build the rest of the base. Add a square foundation to the front and then surround it with high triangle foundations. Then add full walls to the sides and use the front foundation for an airlock. Next, add half walls at the back like this and then roof it all off. Get your airlock doors in and upgrade everything to stone bar the first doorway that we put down. Next, we’re going to hatchet out that wooden doorway which is a bit tedious but necessary. After the doorway is gone, we need to finish off the bunker. Add half walls here and here. Make sure that the top two have the hard side facing you and upgrade them to stone. Destroy the bottom left half wall but leave the bottom right in as we’re going to need it. Now we’re going to fill the base with everything you need starting with storage in your bunker. If you haven’t got large boxes yet you can use small boxes and replace them later. It’s important to note that if you are using the same large box layout as I’ve done here you will need to pick them up in order to upgrade the foundations around them when that time comes. The reason I say start with the bunker storage is so that if someone starts raiding you then you can quickly seal up your bunker and all of your important loot is fairly safe. I’d recommend adding the floors in twig to make placing the rest of your stuff much easier. Additionally, when you are placing your large boxes up top stand on a small box. The last thing to do is to cook up your metal and upgrade your bunker. So these foundations, the section of walls at the back including the inner half walls and then these two triangle floors. You now have yourself a 23-satchel starter base which should deter any early game raiding. Ensure that you keep all of your valuable loot down in your bunker and use the upstairs storage for the rest. Now if you want to add a shooting floor to this design then we’re going to start by getting onto the roof and sealing up this triangle with a door. Once that’s done head back inside and pick out the triangle roof. It’s up to you how you would like to set up your shooting floor. What I’m currently building is just my own preference. Also, you can use wooden window bars for the time being until you get your hands on a BP for something better. Keep in mind that this floor doesn’t need to be too secure. If a raider is coming in via this floor, then they’re already wasting resources. Speaking of bps once you learn the garage door you can fortify your main floor further. Sadly, it has to be garage doors for the loot and furnaces as using double doors blocks you from getting through. Well that’s it for this design, let me know what you think in the comments and if you use the design let me know how it goes. Thanks for watching and I’ll see you guys in the next video!